Even today, just over two years since Kodak filed for bankruptcy, George Eastman’s name is unforgotten for the acute business prowess he demonstrated during the formation of his legacy, the Eastman Kodak Company. Often compared to Apple’s Steve Jobs, Eastman was known for his ingenious business strategies that began the mass commercialization of photography and put a camera in every home. 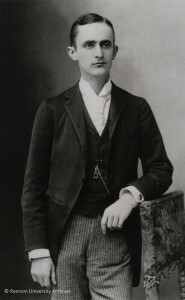 Looking at Eastman’s childhood, it is no surprise that he became such an incisive business man. 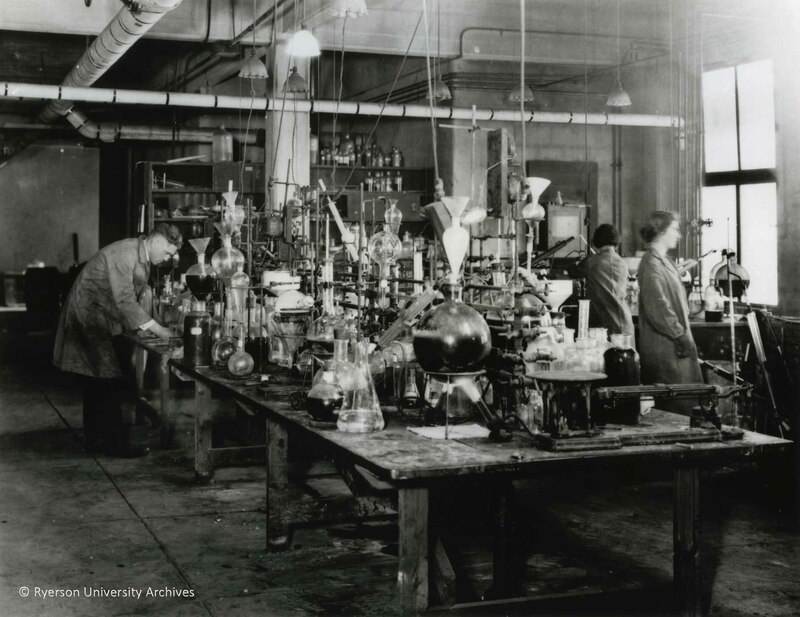 Although his father, George Washington Eastman, passed away when he was only six year’s old, he still managed to found one of the oldest commercial colleges in the world, the Eastman Commercial College, that later became part of the Rochester Business Institute. Entrepreneurialism was in Eastman’s genes. His family did not fare well after the death of George Washington, and as Eastman grew up he watched his mother struggle to keep the lifestyle her family had been accustomed to. It could be said that this may have helped to motivate Eastman to follow in his father’s footsteps. Having shown an early interest in photographs and stereoviews, Eastman’s real journey with photography first began in 1877, when he purchased his first camera to take pictures on a trip he didn’t end up making. At the time, photography was an expensive and labour-intensive hobby that required patience and a lot of equipment. Eastman began experimenting with this camera and before long he had patented his first photographic contributions: a gelatin dry plate emulsion and a mechanism for coating glass plates. With these he began the Eastman Dry Plate Company. By 1881 Eastman had turned his company into a successful and sustainable business, but it was a different invention that truly set the stage for what Eastman’s business would become: film. 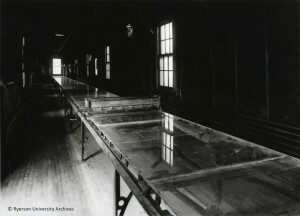 Eastman wanted to find a way to replace the glass from a collodion negative, create a workable holder for that replacement, and build machinery that would be able to efficiently manufacture each invention. He looked to previous unsuccessful attempts at roll-film, such as one by Wernerke from the 1870s, and sought to improve on them and increase their usability. By June 1885, in collaboration with camera builder William Walker, George Eastman had patented and put on the market a form of roll film, a roll holder, as well as a form of sheet paper plates, a more recognizable substitute for glass. With this shift in focus towards his business, the Eastman Dry Plate Company was purchased by the Eastman Dry Plate & Film Company. 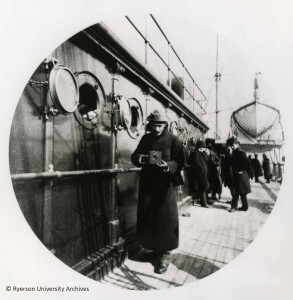 In 1889, George Eastman introduced Flexible Film in rolls, a lightweight, non-breakable substitute for glass. 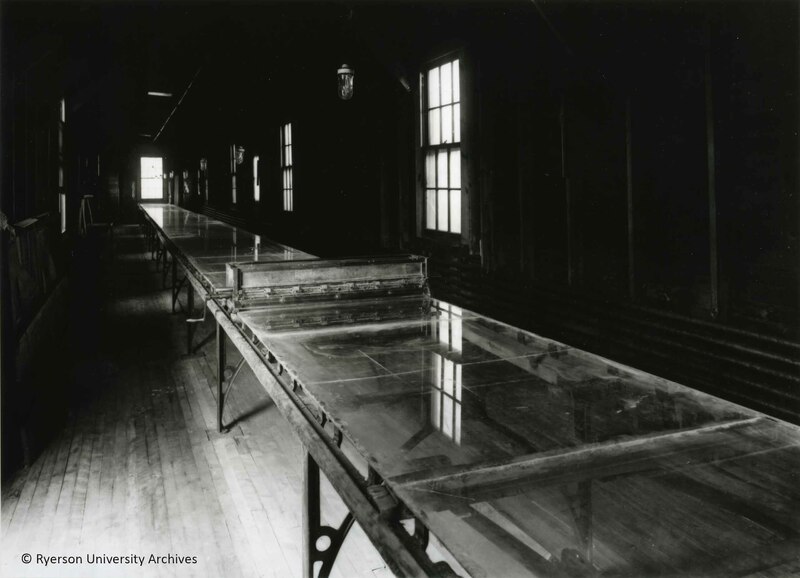 The transparent nitro-cellulose roll film base was cast on these 200-foot long tables. Because of the contemporary fascination with the photography, as well as the labour intensive traits of the hobby, many people involved in the technology were eager to improve on it. During the late 1800s and into the early 1900s many ideas were popping up and photographers wanted to ensure they would receive the credit for them, by applying for patents. Eastman himself was aware of the need to protect his inventions and made sure to attain patents (through application or buying them from other inventors) for every step of his new film system, a strategy continued throughout the life of the company. He, along with his business partners at the time, bought out all their foreign patents as well, and began to initiate step 3, opening an outlet in London, U.K. in 1884. By 1886 Eastman had placed a man named Joseph Thatcher Clarke in charge of in charge of linking the United States with Europe, to help protect the company’s American inventions. Many doubted Eastman’s commitment to his early flexible films, and it did not initially catch on with experienced photographers. Consumers, still primarily established photographers, were not able to produce as good of results as they could with their glass plates. However, Eastman had confidence that the inexpensive and effective qualities of this product would eventually lead to mass manufacturing. 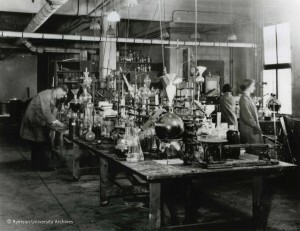 In reaction to poor public response, Eastman added new products to his business: American film and a developing out paper called “Permanent Bromide”, which yielded better results than his earlier paper-based films. He dreamt of popularizing photography to the extent that everyone would participate in the practice, and added a photofinishing service that could provide enlargements and prints to those who used his films. Eastman now sold films, paper, prints and enlargements, yet there was still one component missing from the Eastman Dry Plate & Film Company that was hindering his products from reaching every household, and that was a camera. The first Kodak camera, introduced in 1888, sold for $25, loaded with enough Eastman film for 100 exposures. It produced a 2 1/2 inch diameter negative. 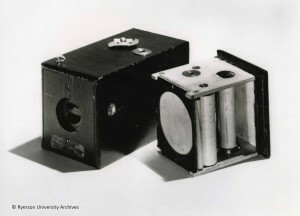 It was in 1888 that George Eastman coined the word Kodak, a unique, short, memorable name that could not be mispronounced, and unveiled his first box camera along with a new system of photographic image making that anyone could use. Along with the slogan “You press the button, we do the rest”, Eastman had found a new market to sell his products to that experienced photographers had refused to buy. Anyone could purchase a camera pre-loaded with a pre-loaded 100 exposure roll of film, take their 100 shots, mail the camera back to the Eastman Dry Plate & Film Company in Rochester, and wait to have their prints and the camera loaded with a new roll of film mailed back to them. Within the next decade Eastman was able to improve his technology to make photography even more affordable, and his dream a reality. Ryerson Library Special Collections, located on the fourth floor of the Ryerson Library, holds numerous examples of the formation of the Eastman Kodak Company, particularly in Canada, including cameras, films, photographs and more! 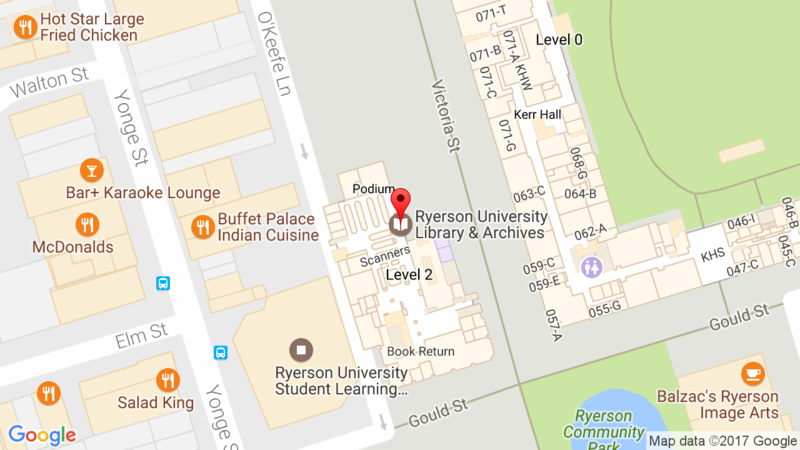 To access Special Collections give us a call or send us an email to book an appointment at: specialcollections@ryerson.ca or 416-979-5000 ext. 4996. Ackerman, Carl W. George Eastman. Collins, Douglas. The Story of Kodak. Jenkin, Reese. Images and Enterprise: Technology and the American Photographic Industry, 1839-1925. Baltimore: John Hopkins University Press, 1897. This entry was posted in Special Collections by Cassandra Rowbotham. Bookmark the permalink.